Steve Siktberg John Dowland for Classic Guitar PDF + Mp3 CD download. Original John Downland Lute Solos Transcribed for Classic Guitar. Composed by Steve Siktberg. For years, classical guitarists have enjoyed playing the lute music of the English composer, John Dowland (1563-1626). Forty of his beautiful compositions are included in this volume. The book is intended for the guitarist with intermediate to advanced fingerstyle technique, and can be played on both nylon and steel string instruments. In order to help capture the unique character of Dowland’s music, renaissance lute tuning (capo on the third fret with the G string tuned to F sharp) is used throughout. The pieces progress more or less in order of increasing difficulty, and special care has been taken to be sure any group of consecutive pieces can be played with satisfying results. Standard notation only. Well laid out and edited with some suggestions for fingerings. Good place to start playing the music of this great composer. 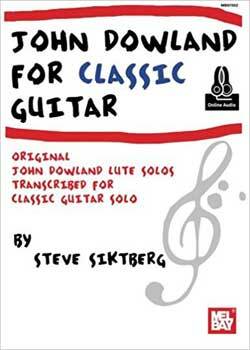 Download Steve Siktberg – John Dowland for Classic Guitar PDF free and other books from our site. Only high quality PDF scans. Please write a review, it's important for our community.